So for my birthday (which I will blog about very soon – lots to blog about the birthday!) W and I went away for a few days, and we had a wonderful time. One of the reasons it was a wonderful time (one of MANY reasons), was that we got to go to Get Knitted – to the actual shop – which is a pretty amazing place, where you can make coffee (well W made coffee), and eat free sweets (yeah we both did that ;), and while I was there I bought some fat quarters of Amy Butler fabric. Today I used them to make this bag. 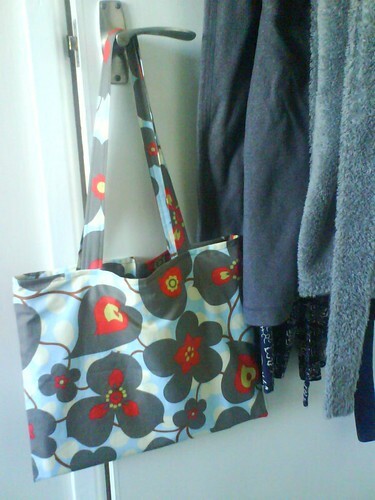 So, anyway, I needed a new bag that I could stick a magazine (or my notes – more on that later) – in. 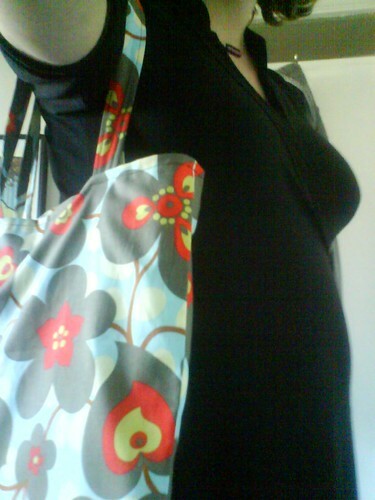 I have a fairtrade co-op shopping bag, which is fine, but the handles are too short to stick over your shoulder. So, having not used my sewing machine in months and months, i cleaned off the dust, made space in the (better but still) messy workroom, and sewed this after work today. …handily accessorized with my new bump. Yes. W and I are grateful to announce that I’m 16 weeks pregnant, and we’re expecting our first child in early October. It’s the main reason why this blog has stayed so quiet for so long – we found out really early (back at the very end of January – which was a wonderful birthday present for W, but then a worrying eight weeks for me), and so we didn’t tell anyone (apart from a tiny group of very very close friends), for weeks and weeks. And I have a new bag, which cunningly is a perfect fit for my favourite magazines, as well as my blue medical folder of notes which comes with me too all my appointments. ← Back from a week of Decorating! Or I LOVE our bedroom now. Hurrah for your shopping bag – I love it. 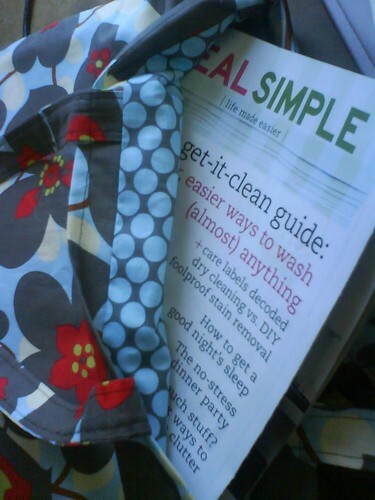 Very good usage of fat quarters – I look forward to seeing it very soon. (Hurrah for being back to blogging and for Baby H).